The Seahawks put together their best offensive performance of the season on Sunday, scoring four touchdowns and kicking a field goal to win 30-20 over the Minnesota Vikings. The matchup between Marshawn Lynch and Adrian Peterson received top billing by the media, and it actually lived up to the hype. Peterson put on an incredibly dominant performance, making a Seahawks team that had been tackling well this season (for the most part) miss badly. Lynch continued to pound the ball and also ran the ball well when he had open space. Peterson finished with 182 yards and two touchdowns on the ground to Lynch’s 124 with a touchdown. Apart from the consistency of Lynch, this team is starting to look a bit different than it did just a few weeks ago. If the Seahawks were to win in the first half of the season, they were primarily getting it done on the back of the defense. Being tough against the run and keeping the opposition out of the end zone were keys to the success of the defense, and the team, in the first half. The defense in recent weeks has struggled relative to how they were playing at the start of the year, although holding the Vikings to 44 net yards passing is hardly struggling. Inconsistent is a better way to describe them. Last week they were beat in the passing game and against the Vikings and 49ers it was the running game. Coach Carroll didn’t seem to have an explanation for why that was besides the fact that the team has been in position for, but missing, key tackles. Fortunately, the offense continues to look better and better. Seahawks receivers dropped a few passing on Sunday, but the same Seahawks offense that had trouble sustaining long drives and scoring in the red zone is getting the job done now. I was really looking forward to seeing how the Seahawks would handle a Vikings line at home that is very similar to San Francisco’s. Despite having some injury issues (the new norm?) the line played very well and gave Wilson a chance to be very comfortable. Wilson was sacked only once and I thought Russell Okung did a great job handling Jared Allen. Although they lost on the road to the 49ers, I’m now confident the Seahawks will be able to pull out the win at home. Another guy who had a great day was Golden Tate. He only caught four passes for 28 yards, but his 11-yard touchdown where he made four different guys miss and leapt into the end zone was a tremendous play. Wilson also hit him in stride running across the back of the end zone for the first Seahawks score. 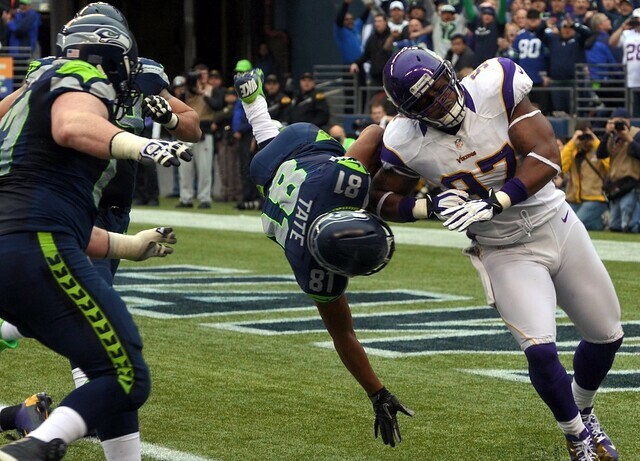 Sidney Rice caught four passes, one of which was a touchdown, and he threw a 25-yard strike to Zach Miller. In the press conference after the game, Wilson said that sometimes he thinks Rice throws a better ball than he does. Defensively, the two turnovers they caused were a huge factor in the game. The first forced fumble and recovery by Marcus Trufant led to the Hawks first touchdown. Had the Vikings not turned the ball over early and gone on to score, the game could have been 10-0 or 14-0 to start the first quarter. Instead the Seahawks tied the score at 7-7 on Wilson’s 6-yard touchdown pass to Tate. Brandon Browner made it look like the pass was meant for him as he got perfect position on Percy Harvin. With more than five minutes left on the clock, Seattle was able to run the football, convert two fourth down plays on Minnesota’s side of the field, and eventually take a knee on the 11-yard line to end the game. The Seahawks move to 4-0 at home and 5-4 on the season, just a game and a half behind the division leading 49ers. If the season ended today, they would earn the final Wild Card spot breaking a tie with the 5-4 Vikings because of the win. The Cardinals lost their fifth straight game with a 31-17 loss to the Packers and the 49ers and Rams were idle with their bye week. It’s exciting to see the team in full control of their ability to make the postseason, while Wilson is looking more and more confident with the offense. The New York Jets (3-5) come into Seattle on Sunday. They’re coming off a 30-9 loss at home to the Dolphins and get an extra week to prepare for the Seahawks with their bye week. You might think that gives them some sort of advantage, but not against this Seattle team. Dallas, Green Bay, and now Minnesota all had more than seven days to prepare for their game against the Seahawks, and it didn’t turn out so well for them either. Bring on the Jets!